You can protect your work top by covering it with a thick layer of newspapers but after three or four cuts the paper will be looking pretty mangled. 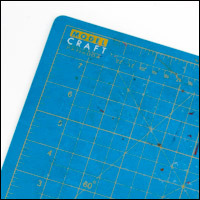 If you are doing any more than a little cutting then cutting mats are essential. 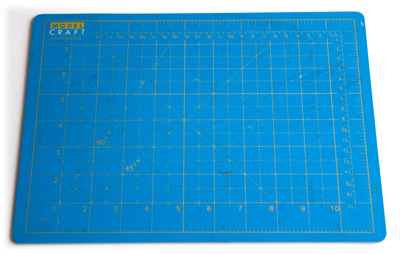 The self healing surface of a cutting mat mean that they last for ages. Cutting mats don't react well to heat though. Don't lean them up against a radiator or stand your coffee on them. I used my old neoprene mouse pad as a firm cushion under the paper during scoring and found that it also works as a cutting mat. It's worth mentioning that cutting mats are much better for your knife than cutting on a hard surface. The tip of a blade is the most useful part, and it won't be blunted if it goes into a cutting mat. You can buy A4 size mats very cheaply – our local pound shop often has them.